More and more people are living longer in our increasingly advanced society and they are faced with highly complex medical conditions. That's one reason physiatrists are becoming ever more important in the health care environment. In fact, Physiatry is one of the fastest-growing fields in medicine. Physiatrists care for people who are dealing with amputations, birth defects, brain injuries, burns, hip fractures, orthopaedic conditions, spinal cord injuries, strokes and other neurological diseases, sports injuries, trauma from an accident, and work-related injuries. Each of these medical conditions requires long-term rehabilitation and assistance from a dedicated team of health care professionals. 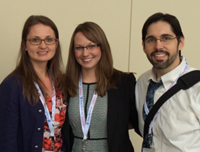 Physiatrists make a difference in people's lives to improve function and quality of life. At the University of Rochester Medical Center, our Physical Medicine and Rehabilitation Residency Program trains its residents to acquire the essential knowledge and technical skills for rehabilitation and well-being of patients. We also prepare trainees to practice independently in a variety of settings. Our program promotes the development of their research interests, as well as their critical reasoning and administrative skills. From a personal standpoint, PM&R is a specialty that is quite compatible with family life. At the University of Rochester Medical Center, we are dedicated to helping each and every trainee advance his or her career. Each trainee teams up with a faculty advisor and research mentor. In addition, they receive memberships in the leading national PM&R associations, namely the Association of Academic Physiatrists (AAP) and American Academy of Physical Medicine and Rehabilitation (AAPM&R). Residents also receive funds for books and costs related to attendance at national academic meetings. Our humanistic emphasis prepares each of our graduates to learn, teach and practice medicine with professionalism, compassion and discipline. Our structured teaching includes a hands-on ultrasound course and significant exposure to a variety of injection procedures including spinal epidurals, ultrasound-guided, and botulinum toxin injections. The University of Rochester is a Level-1 trauma center, CARF-accredited (Commission for the Accreditation of Rehabilitation Facilities) spinal cord injury and stroke system of care. Rochester boasts one of the most active spinal cord disability networks in the region and residents are involved in community service for people with spinal cord disability. Our excellent curriculum prepares our residents well for board exams. We offer twice-yearly mock orals which are well received by the current residents and prepare them for part 2 of the PM&R boards for certification. The rotations and didactic curriculum enables our residents to secure competitive positions of their choice after graduation. These are among the reasons we attract more qualified applicants each year making entrance to our program more competitive. We are both Rochester natives, and have attended out of area medical schools and residencies, and chose to return to Rochester for the variety of opportunities that it has to offer. 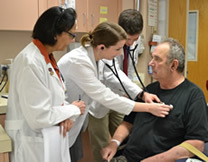 The University of Rochester Medical Center's Physical Medicine and Rehabilitation Residency Program is sponsored by Strong Memorial Hospital (SMH) – a 850-bed, Level I trauma center that serves as URMC's main teaching hospital. 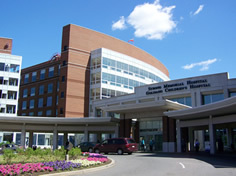 The hospital is a tertiary and quaternary care referral center for upstate New York, as well as a bone marrow, cardiac, liver, and renal transplant center. It is accredited by the Joint Commission on Accreditation of Healthcare Organizations (JCH) and has been named one of America's best hospitals by U.S. News & World Report. At SMH, our 20-bed rehabilitation unit is comprised of single and double rooms, and updated therapeutic facilities and equipment for both adult and pediatric patients. Our facility is the only CARF (Commission on Accreditation of Rehabilitation Facilities) – accredited Spinal Cord System of Care in the upstate New York region. PM&R residents spend the majority of their time at SMH and its outpatient locations – including Clinton Crossings, a state-of-the-art outpatient setting offering on-site diagnostic imaging, including X-rays, CT scans, and MRIs. Additionally, residents participate in rotations at our sister facility Highland Hospital, the Golisano Children’s Hospital, and the Golisano Restorative Neurology & Rehabilitation Center at Unity, and the Highlands at Brighton (HAB), all are located within easy driving distance from Strong. At Strong Memorial Hospital, patient demographics and outcomes, as well as medical records, are electronic. This information can be accessed via any terminal on the network and from the outpatient comprehensive Rehabilitation Center at Clinton Crossings. The Miner Library at The University of Rochester Medical Center is a comprehensive, world-class medical library with a dedicated librarian assigned to the department for assistance. A smaller library at Unity contains essential medicine, neurology, pediatrics and comprehensive PM&R references and journals. 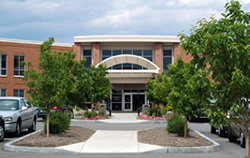 Both facilities have computerized literature search capabilities and belong to the interlibrary loan service, which enables users to borrow books and journals from libraries throughout the eastern United States.